A hammer is a hammer - right? 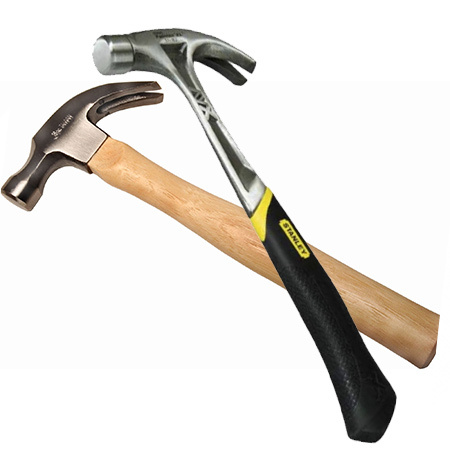 There are different types and weights of hammers. If you're a woman, choosing the right hammer can make projects that require using a hammer much easier. While we women like to think we're just as good as men when it comes to DIY... we have our limits! So, when you're doing projects that require the use of a hammer, such as tapping in panel pins or wire nails, invest in a hammer that is specifically designed for women. Hammers are available in a variety of types, but the most common hammer you will use for home projects is a Claw Hammer. This hammer has a pair of steel jaws on one side - the claw part - that can be used for removing nails. Handy if you like working with reclaimed wood pallets. What is more important when buying a hammer is to look at the weight. Hammers can be 250gr up to just over 900gm - 250gm being the ideal weight for a women to wield. Anything heavier than this and your arms and shoulders will start to take strain. And let's be honest, while we might love DIY - we want it to be as easy as possible and not work up a sweat! Another factor to consider when choosing a hammer is comfort. It may sound silly, but if you plan on using a hammer for hundreds of panel pins or wire nails, you will find a rubber, slip-resistant handle reduces hand fatigue and is far more comfortable to work with. Plus, there are now hammers that reduce vibration and shock impact and thus, stress and strain on your arms. Pop into your local Builders Warehouse or hardware store to see the selection of MTS, Lasher, Stanley and other brands, and select the hammer best for you!